There are plenty of ways to recognize the pioneering women who've made unique contributions to science, technology, engineering, and math. But GE chose an unorthodox strategy by creating custom-designed animations of 12 influential women in STEM and projecting them onto the ceiling of Grand Central Terminal in New York City. That famous tourist attraction and commuter hub is known for its high ceiling, which features a stunning constellations. So naturally GE chose 12 female scientists and engineers and illustrated their faces amongst the stars. Tourists and commuters can see the 7-minute "Unseen Stars" projections at different times starting Tuesday until Thursday at 11:59 p.m. The stunt is part of GE's Balance the Equation initiative. The campaign aims to have 20,000 women available to fill STEM jobs at GE by 2020, while also reaching 50-50 representation in the company's technical entry-level programs. "In addition to internal hiring and retention goals, GE also wants to publicly celebrate influential female scientists and engineers so more young women consider careers in the field," the company said in a statement. The roster of 12 women includes Millie Dresselhaus, the first woman to receive the National Medal of Science in Engineering; Laurie Leshin, a geochemist in search of life on Mars; and Hadiyah-Nicole Green, a physicist who developed technology to use laser-activated nanoparticles in treating cancer. 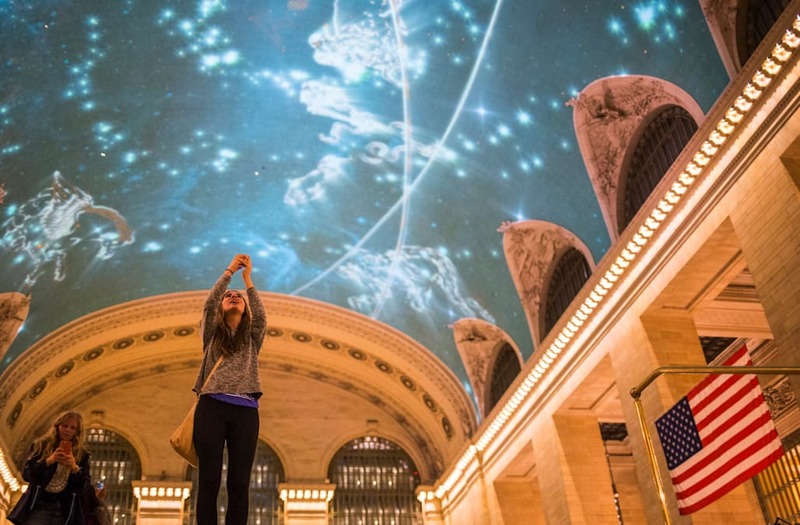 And if that's not cool enough for you, consider this: geofilters and Facebook frames will make it possible for people passing through Grand Central to capture a selfie with the projections until the campaign ends on Thursday. Think of it as just one more way to take those "unseen stars" and share them with the world.